Mahnaz Afkhami is Founder and President of Women’s Learning Partnership, former Minister for Women’s Affairs in Iran, and editor of Faith and Freedom: Women’s Human Rights in the Muslim World. 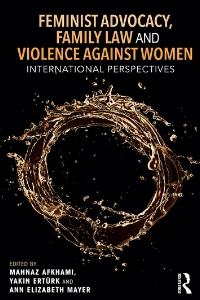 Yakın Ertürk is former UN Special Rapporteur on Violence against Women, its causes and consequences, former Director of the Division for the Advancement of Women (DAW), and author of Violence without Borders: Paradigm, Policy and Praxis Concerning Violence Against Women. Ann Elizabeth Mayer is Associate Professor Emeritus of Legal Studies and Business Ethics at the Wharton School of the University of Pennsylvania, USA, and author of Islam and Human Rights: Tradition and Politics.